A few days back, I wandered around Lorong Kurau for food and settled for Baan Aa-Haan Thai. 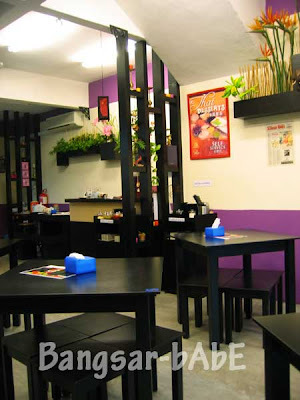 Known as a “casual Thai dining” outlet, their prices are also pretty affordable. The restaurant had a simplistic interior – wooden tables and chairs with newspaper cuttings framed up on the walls. I ordered their green curry chicken while rif had the tom yam mee hoon. 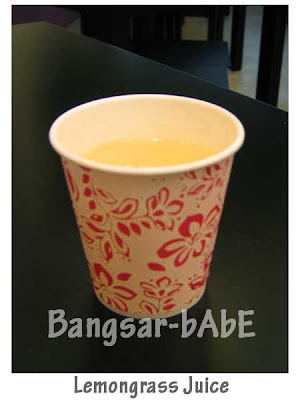 Even though we ordered ice lemon tea and iced water, they gave us a cup of lemongrass juice each to try. My Green Curry Chicken came with white rice. Don’t let its mild outlook fool you. The curry packed a punch. One sip and I could feel the burning sensation working its way from my tongue to my tummy. I thought the curry could do with a bit more coconut milk as I’m used to green curry being creamier. The tom yam noodle soup was fiery red in colour. However, looks can be deceiving as it was not as spicy as it looked. We both thought it wasn’t spicy or sour enough. The tom yam had a generous amount of prawns, squid, chicken and oyster mushrooms. The lemongrass juice was refreshing. It is an acquired taste, one which rif didn’t like. I had his portion. The ice lemon tea was pretty standard, so I won’t bother elaborating. We didn’t try their dessert as it was too close to dinner time. We paid RM18.10 for the meal. All in, this no-frills place serves OK tasting Thai food as reasonable prices. Verdict: Not bad, but nothing spectacular. I wouldn’t mind trying their desserts next time. loved this place for their chicken rice..so secluded too! 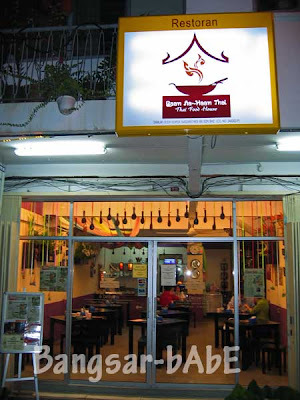 Heyz other than this, do you know of any other Thai food restaurants around PJ ? Try Thai Corner. I like going there. The food’s decent and affordable. Thanks, cooked by a Thai cook? Wow, u’re really prompt in your replies. Not sure about that. But I do know they are foreigners. My guess is that it’s Thai, but the cooking is adjusted to suit our local tastebuds. Cheers, i’ll try it out. Does my nick ring a bell ?